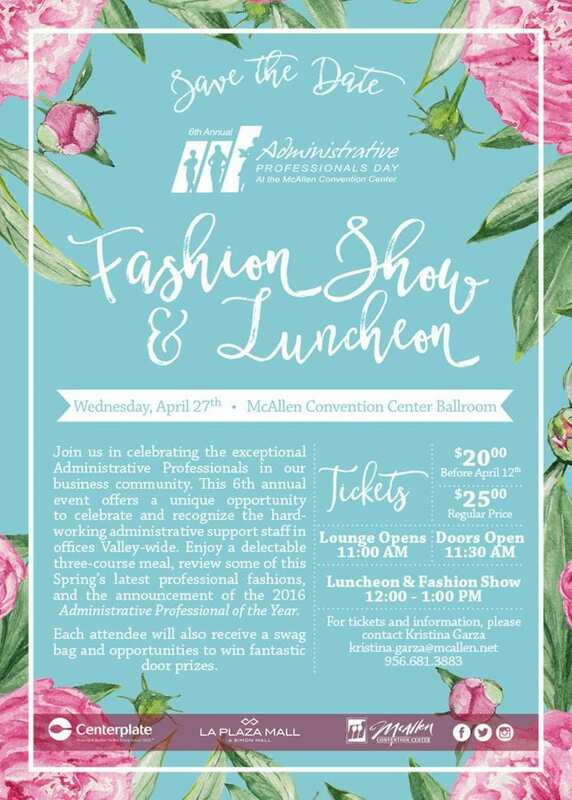 Celebrate administrative professional day on Wednesday, April 27th with a great fashion show, prizes and a delectable three-course meal, all at the “6th Annual Administrative Professional Fashion Show and Luncheon” at the McAllen Convention Center Ballroom! Review some of this spring’s latest professional fashions provided by La Plaza Mall! See who will be named 2016 Administrative Professional of the Year and enjoy great goodies, including a swag bag and opportunities to win fantastic door prizes. There is no better way to recognize the exceptional Administrative Professionals in our business community than by attending this great event! Tickets at the door are $25. The lounge opens at 11:00 AM and doors will open a half hour later. The luncheon and fashion show will start at noon. For more information, contact Kristina Garza at 956.681.3883 or at kristina.garza@mcallen.net. Get Ready for the Rio Grande Valley’s Largest Wedding Fair!